Has Mancy Matula finally been found? Authorities have notified the family of missing 24 year old Mancy Matula, who has been missing since May 2013 in Eden Prarie, Minnesota. that a hiker had discovered human remains in a Stearns County Park that could be the missing woman. The remains were found in a shallow grave at approximately 1 pm Saturday afternoon. Eden Prairie police said Saturday that the identity and gender of the remains have not been confirmed. Mandy Matula was last seen Thursday around 1:30 a.m. with her estranged boyfriend, 24 year old David Marshall Roe. Matula’s former boyfriend, David Roe, was wanted for questioning in her disappearance, shot himself in the head in a police parking lot prior to questioning. Wayne Matula told KSTP-TV that police notified his family that a hiker had discovered remains in Mississippi River Park near Sartell Saturday afternoon that may be his daughter Mandy’s. The park had been a focal point of the search for Mancy Matula after she went missing May 1. She was last seen that day leaving her Eden Prairie home with her ex-boyfriend, David Roe. Human remains found near St. Cloud may be missing former UMD softball player. The Stearns County Sheriff’s Office reported the remains were found by a hiker in a shallow grave in Mississippi River Park. The Eden Prairie (Minn.) Police Department reported it is “working closely with Stearns County officials and the Minnesota Bureau of Criminal Apprehension to determine if the finding is related to the Mandy Matula missing person investigation.” However, as of Saturday evening the gender and identity of the remains had not yet been determined. UPDATE I: Body found in Shallow Grave is Confirmed to be Missing 24 year old Mancy Matula. Officials in Minnesota say that remains found in a shallow grave this weekend are those of a 24-year-old woman who had been missing since May. There is more evidence connecting ex-boyfriend David Roe, who has since committed suicide, to the disappearance and possible death of missing Mandy Matula. DNA testing confirmed Mandy Matula’s blood was on a jacket found in the car of her ex-boyfriend, David Roe. Mandy Matula has been missing since May 2, 2013 in Prairie, MN. David Roe had been considered a person of interest in her disappearance; however, shot himself in the head and later died in a parking lot just prior to his questioning. The investigation into the disappearance of 24-year-old Mandy Matula of Eden Prairie, Minn., has yielded new evidence, further tying her ex-boyfriend, who has since died, to the case. Police said DNA testing confirmed Matula’s blood was on a jacket found in the car of her ex-boyfriend, David Roe. Authorities said they believe Roe, 24, of Victoria, Minn., was with Matula before she was reported missing. In addition, ballistics testing on an unfired bullet found near an Eden Prairie church Saturday came from the same gun Roe used to shoot himself in the head, according to a news release. The ammunition was found near the Victory Lutheran Church May 4. by community volunteers helping with the investigation. Also, police confirmed that an unfired bullet discovered Saturday near an Eden Prairie church was from the same gun that her boyfriend, David Roe, used to shoot himself. 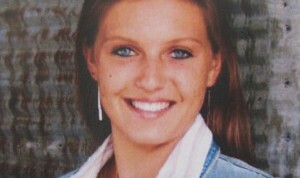 24 year old Mandy Matula has been missing since Thursday, May 2, 2013 in Eden Prairie, Minnesota. Mandy Matula was last seen Thursday around 1:30 a.m. with her estranged boyfriend, 24-year-old David Marshall Roe. The two were reported to have been driving in Roe’s black Ford Escape with Minnesota license number 802-KNA. Her parents reported her missing at 8:30 a.m. Thursday when she failed to show up for her job as a city maintenance worker. Matula’s former boyfriend, David Roe, who was wanted for questioning in her disappearance, shot himself in the head in a police parking lot prior to questioning Thursday afternoon. Eden Prairie Police Lt. Bill Wyffels says Matula was reported missing Thursday morning after she didn’t show up for work. Police believe she was with Roe in Miller Park around 1:30 a.m. Thursday. Volunteers and police officers have searched the park but reportedly turned up nothing. Police say Roe placed a note on his dashboard prior to shooting himself. Authorities have not released what was written on the note. Matula’s father told CBS Minnesota that Roe and Matula broke up six months ago after a year-and-a-half of dating, but still saw each other frequently. UPDATE I: Note found in dashboard of missing Minnesota woman’s boyfriend’s car. This is obviously never a good sign in a missing persons case when the person of interest and the last person to be with the missing person tries to commit suicide before being questions by police. UPDATE II: Search continues for Missing Mandy Matula. As police and volunteers continue to search for 24-year-old Mandy Matula, she has been missing since Wednesday night, we’re learning more about the man police are calling a person of interest in the case. UPDATE III: Ex-boyfriend David Roe is dead from self-inflicted gunshot would to his head. This is not good news for the case of missing Mandy Matula. The whereabouts of missing Mandy Matula may have just died along with her ex-boyfriend Davis Roe. A man who shot himself in the head before police could question him about the disappearance of a Minnesota woman died today, the county medical examiner said. A woman who answered the phone at the Hennepin County Medical Examiner confirmed David Roe’s death to ABC News. Authorities have said they believe Roe, 24, of Victoria, Minn., was with Mandy Matula, of Eden Prairie, Minn., before she was reported missing Thursday morning, according to a news release. UPDATE IV: Boyfriend of missing Eden Prairie woman bought gun last week. In the hours between when the couple was last seen and Roe drove to the police station, evidence indicates Roe did “a lot of travel in and around Eden Prairie,” including places in Carver and Stearns counties, Reynolds said. One potential clue: an unspent cartridge found Saturday in the Victory Lutheran Church parking lot in Eden Prairie that is “consistent with what he had with him,” Reynolds said. The cartridge was the same type of round, caliber and brand as the ammunition for the gun Roe bought on April 27 in Carver County, the chief said. Reynolds wouldn’t say where Roe bought the gun, but said the purchase was legal. Forensic tests have yet to link the cartridge to Roe and its recovery “hasn’t led” anywhere in the search for Mandy Matula, Reynolds said. For more updates, to discuss the case and read others opinions and analysis … go to Scared Monkeys Missing Person’s Forum: Mandy Matula. If anyone has any information that could lead to the whereabouts of Mandy Matula, please call Eden Prairie Police at (952) 949-6200.